The two species of elephant, African and Asian, have plenty in common, among them one "big" thing: They're huge. In fact, the African elephant is the single biggest land animal anywhere on the planet. While elephants are born with a respectable head start in the size department, they put in plenty of work to maintain their impressive size -- if you consider almost constant eating to be a form of work, that is. While African elephants are a little bigger than Asian elephants, the two types are both very large. Female adult African elephants can weigh less than 5,000 pounds up to more than 7,000; males range between 10,000 and 13,500 pounds. Asian elephants weigh on average about 1,000 pounds less than their African counterparts. Female asians grow to 7 feet at the shoulder, males to 9. Africans grow to heights of 8 to 13 feet at the shoulder, and their muscular trunks extend their reach beyond that height. 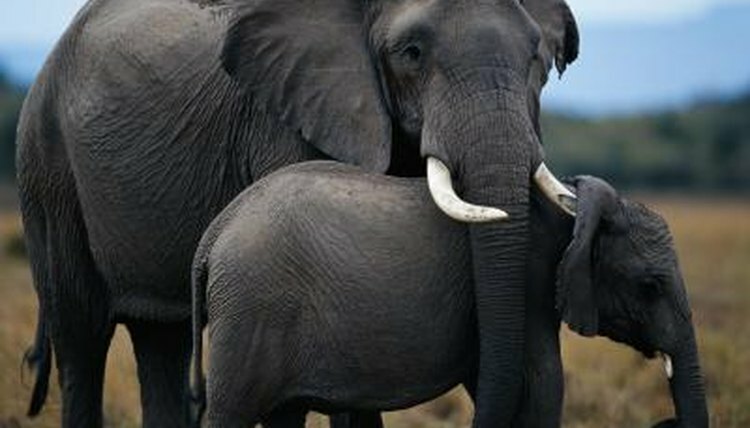 Because African elephants are so big, virtually no predators attack them -- they're vulnerable to predators like crocodiles and lions only when they're babies. Despite their intimidating adult size, though, elephants aren't without enemies. The African elephant is a threatened species historically poached for its ivory tusks. Of course, a big size creates a big appetite, so elephants devote plenty of time to eating. They spend 16 to 18 hours every single day foraging and feeding, supporting their herbivore diets with 300 to 375 pounds of food per day. They eat grass, plants, fruit, bushes -- virtually any vegetation they can wrap their trunks around. Naturally, they wash it all down with plenty of water. An elephant typically drinks 18 to 40 gallons of water per day, depending on size and season -- a particularly big and thirsty adult male can guzzle down 55 gallons in just a couple of minutes. After nearly 22 months of gestation, female elephants give birth to babies that can weigh up to 200 pounds. Because of the length of the pregnancy and the delivery of a genuinely massive baby, female elephants don't typically get pregnant more than once every few years. Because they're so big, elephants have some special dietary needs they fulfill in unconventional ways -- like eating dirt, for example. Elephants dig up earth with their tusks, then chow down on the soil for valuable minerals and salt. They similarly use their trunks to scrape the bark off trees, which is good for their digestive tracts and supplies them with the calcium they need for strong teeth and bones. Houston Zoo: Gift of Grub: What Do Elephants Eat?